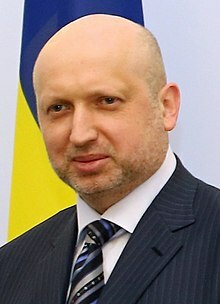 Oleksandr Valentynovych Turchynov (Ukrainian: Олександр Валентинович Турчинов) (born March 31, 1964) is a Ukrainian politician, screenwriter, and Doctor of Economic Sciences. Turchynov is the current Chairman of the Ukrainian Parliment. He has previously served acting President and Prime Minister of Ukraine. Turchynov became acting president after mass protest across Ukraine caused the impeachment and removal of Viktor Yanukovych presidency.